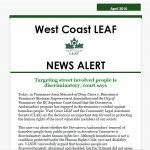 Vancouver Area Network of Drug Users (VANDU) v Downtown Vancouver Business Improvement Association (DVBIA) started as a human rights complaint against the DVBIA for their treatment of people who are homeless in the downtown core of Vancouver. In particular, it was concerned with the “removals” of this population from sidewalks and city parks by Downtown Ambassadors who are employed by the DVBIA. VANDU and Pivot Legal Society (the Complainants) argued at the B.C. 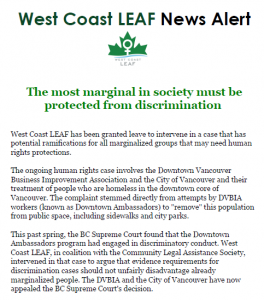 Human Rights Tribunal that such “removals” were a violation of the BC Human Rights Code (the Code) because the DVBIA’s program specifically targeted people who are homeless, a population that is disproportionately comprised of people with disabilities and people of Aboriginal ancestry. Discrimination on the basis of race, ancestry or disability (including addiction) is prohibited by the Code. The Tribunal found that the population in question (people who are homeless in downtown Vancouver) is disproportionately comprised of people of Aboriginal ancestry and people living with a disability, and that the DVBIA targeted homeless people in downtown Vancouver; however, the claim failed because the Complainants failed to show that the DVBIA’s actions disproportionately impact people of Aboriginal ancestry and people living with disabilities who are homeless. Because the Code only prohibits discrimination on the basis of things like race and disability (and not homelessness), the claim failed. In turn, VANDU brought a judicial review (which is sort of like an appeal) to the BC Supreme Court. On April 10 2015, the BC Supreme Court found that the Downtown Ambassadors program engaged in discriminatory conduct against homeless people. The Court has sent the case back to the BC Human Rights Tribunal to determine whether the discriminatory conduct can be justified. However, the DVBIA and the City of Vancouver appealed the BC Supreme Court decision to the BC Court of Appeal. 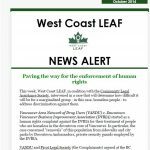 West Coast LEAF is working in coalition with Community Legal Assistance Society. Our Coalition was granted leave (given permission by the court) to intervene in the judicial review at the BC Supreme Court in order to argue that the Tribunal decision unlawfully increases the burden of proof against people who claim that they are being discriminated against, making it harder to win these kinds of cases. We argued that this is an especially unfair disadvantage for already marginalized people. In August 2015, the coalition was again granted leave to intervene in the case at the BC Court of Appeal. The case was heard in October 2016. 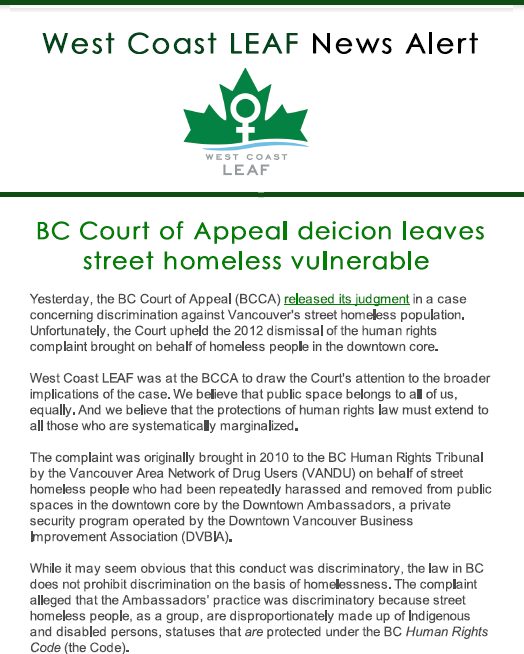 The BCCA decision, released April 11, 2018, upheld the 2012 dismissal of a human rights complaint brought on behalf of the population of homeless in downtown Vancouver. The Court unanimously found that, while the actions of the Downtown Ambassadors had negatively impacted the street homeless population, and that Indigenous and disabled persons (groups protected by human rights law) are over-represented in the street homeless population, the evidence presented was not enough to show that Indigeneity and disabled status were factors in the negative treatment experienced by the group to show discrimination under the Code. 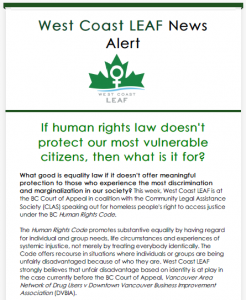 West Coast LEAF believes that the BCCA judgment leaves open the possibility that, in a future case, the type of treatment experienced by the homeless population in this case may be regarded as discriminatory under human rights law. The Supreme Court of Canada denied the application for leave to appeal the BCCA decision.